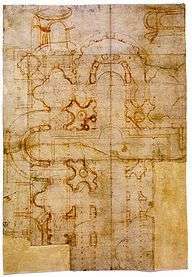 Donato Bramante (1444 – 11 March 1514), born as Donato di Pascuccio d'Antonio and also known as Bramante Lazzari, was an Italian architect. He introduced Renaissance architecture to Milan and the High Renaissance style to Rome, where his plan for St. Peter's Basilica formed the basis of design executed by Michelangelo. 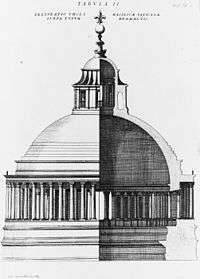 His Tempietto (San Pietro in Montorio) marked the beginning of the High Renaissance in Rome (1502) when Pope Julius II appointed him to build a sanctuary over the spot where Peter was allegedly crucified. Bramante was born under the name Donato d'Augnolo, Donato di Pascuccio d'Antonio, or Donato Pascuccio d'Antonio in Fermignano near Urbino. Here, in 1467, Luciano Laurana was adding to the Palazzo Ducale an arcaded courtyard and other Renaissance features to Federico da Montefeltro's ducal palace. Bramante's architecture has eclipsed his painting skills: he knew the painters Melozzo da Forlì and Piero della Francesca well, who were interested in the rules of perspective and illusionistic features in Mantegna's painting. Around 1474, Bramante moved to Milan, a city with a deep Gothic architectural tradition, and built several churches in the new Antique style. The Duke, Ludovico Sforza, made him virtually his court architect, beginning in 1476, with commissions that culminated in the famous trompe-l'oeil choir of the church of Santa Maria presso San Satiro (1482–1486). Space was limited, and Bramante made a theatrical apse in bas-relief, combining the painterly arts of perspective with Roman details. There is an octagonal sacristy, surmounted by a dome. In Milan, Bramante also built the tribune of Santa Maria delle Grazie (1492–99); other early works include the Cloisters of Sant'Ambrogio, Milan (1497–1498), and some other constructions in Pavia and possibly Legnano. However, in 1499, with his Sforza patron driven from Milan by an invading French army, Bramante made his way to Rome, where he was already known to the powerful Cardinal Riario. Bramante also worked on several other commissions. Among his earliest works in Rome, before the Basilica's construction was under way, is the cloister (1500–1504) of Santa Maria della Pace near Piazza Navona. Cortile del Belvedere, Vatican City, Rome, 1506..
↑ Davies & al. (1996), p. 642. ↑ EB (1878), p. 213. 1 2 EB (1911), p. 418. "Bramante", Encyclopædia Britannica, 9th ed., Vol. IV, New York: Charles Scribner's Sons, 1878, pp. 213–214 . "Bramante", Encyclopædia Britannica, 11th ed., Vol. IV, Cambridge: Cambridge University Press, 1911, p. 418 . Wikisource has the text of the 1913 Catholic Encyclopedia article Donato Bramante. Wikisource has the text of the 1911 Encyclopædia Britannica article Bramante. Donato Bramante Source Information, Pictures & Documentaries about Donato. 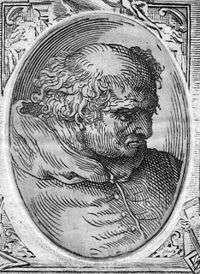 Wikimedia Commons has media related to Donato Bramante.